Today is National Breakfast Day, March 8th. Here in our household we're pretty big on breakfast, especially on the weekends. Usually the hubby gets up and lets me sleep in while he makes the entire household a huge breakfast with pancakes, bacon, sausage, hashbrowns and omelets. He does the works. I told him today was National Breakfast Day and since he had to work this morning he wanted to do a little special for the kids. So last night before we went to bed he made them a few heart and car shaped pancakes and put them in the fridge so that I could heat them up this morning. And since I'm on Weight Watchers he made me an egg with salsa on it with a wheat English muffin. He spoils us. What are you doing to celebrate it? Kelloggs is celebrating National Breakfast Day by partnering up with Breakfast Clubs of Canada and Breakfast for Learning to launch their Share Your Breakfast program. The Share Your Breakfast Program's goal is to encourage Canadians to help children who might otherwise go without. As part of this movement, Canadians are invited to celebrate National Breakfast Day on Thursday, March 8. Throughout the day and across the country Kelloggs will be surprising Canadians with free mini-packs of Kellogg's Rice Krispies cereal to raise awareness about our country's hungry children. 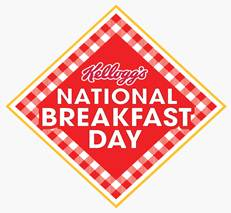 In return, Kelloggs will be donating to their National Breakfast Day charity partners. In essence, a bowl for you will equal a bowl for a hungry child. Visit Kellogg’s website (www.kelloggs.ca/SYB) to view the breakfast video and share this important message with friends and family via social media. Pick-up a specially marked box of Kellogg's cereal in-store for a unique pin code to redeem for a free breakfast item and; in return, Kellogg’s will make a donation to Breakfast Clubs of Canada and Breakfast for Learning.